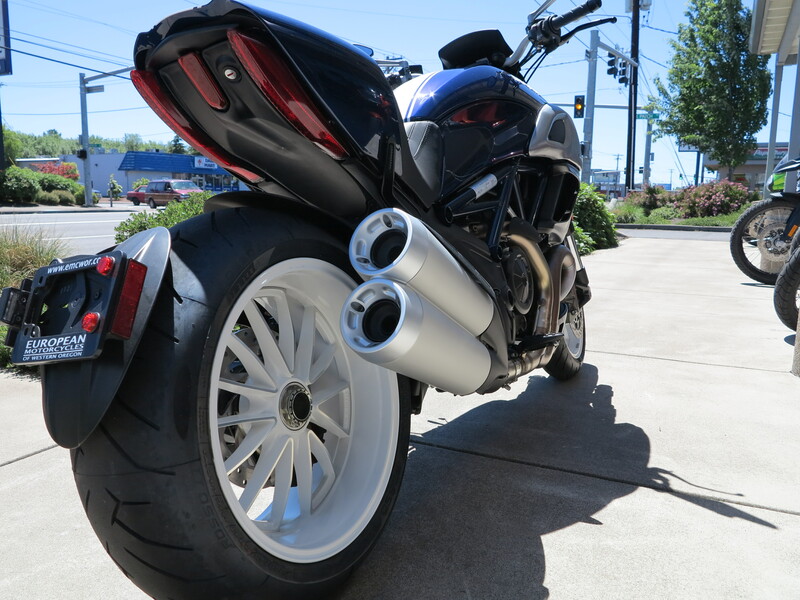 The Diavel is a unique motorcycle. It is difficult to know what the hell (pun intended) Ducati wanted to accomplish with it. 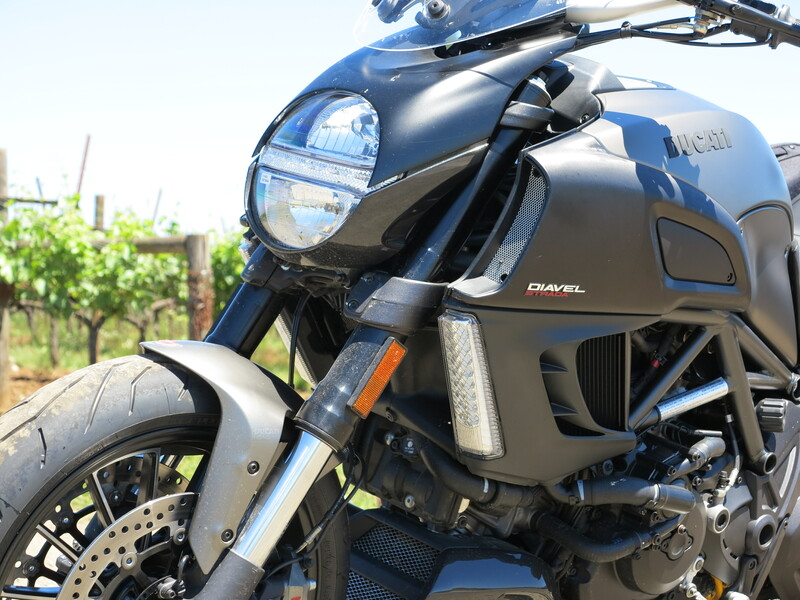 The Diavel project began under the leadership of Ducati’s previous design chief, Pierre Terblanche, who commissioned Glynn Kerr, freelance designer and design columnist for Motorcycle Consumer News, to produce the initial concept sketches. The result is a an attractive, boundary expanding (or better yet, boundary blurring) motorcycle combining known Ducati elements, such as superbike performance and an aggressive design, with elements not commonly associated with a Ducati motorcycle such as a relaxed riding nature and riding ergonomics. Read along as I will describe my first ride on this motorcycle and will explore what makes this motorcycle desirable. As a bonus, I embedded at the end of the story a nice Cycle World video of this motorcycle in action on the bed of a dry desert lake. 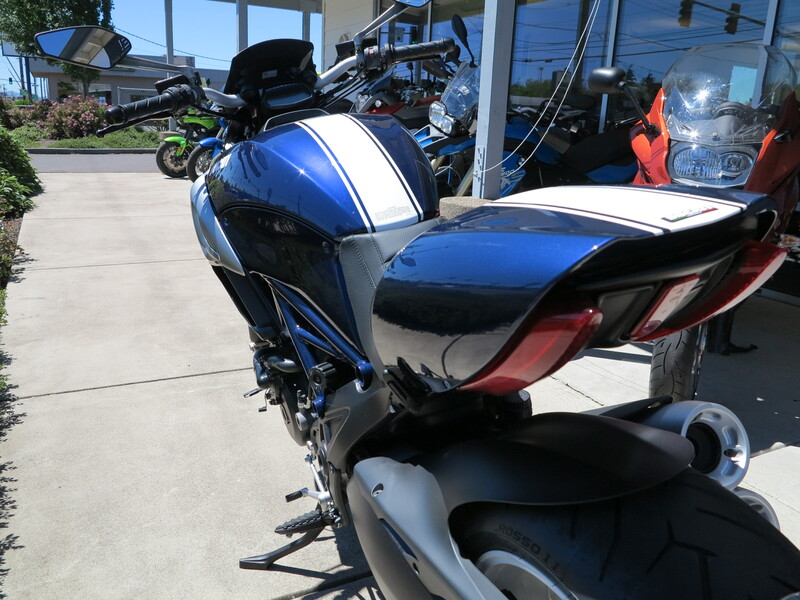 Not the Diavel Strada: Beautiful Blue with White Stripe Ducati Diavel. Photographed June 8th, 2013. The Diavel has been around for at least two years in several versions: base, carbon, and I remember a limited run of a gorgeous AMG version. 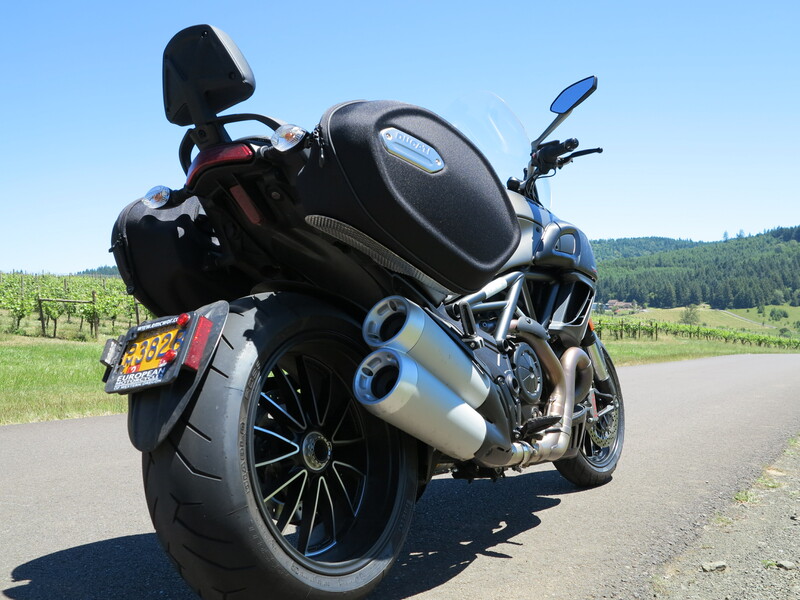 The recent launch of the Diavel Strada allowed me an opportunity to take it out for a spin. 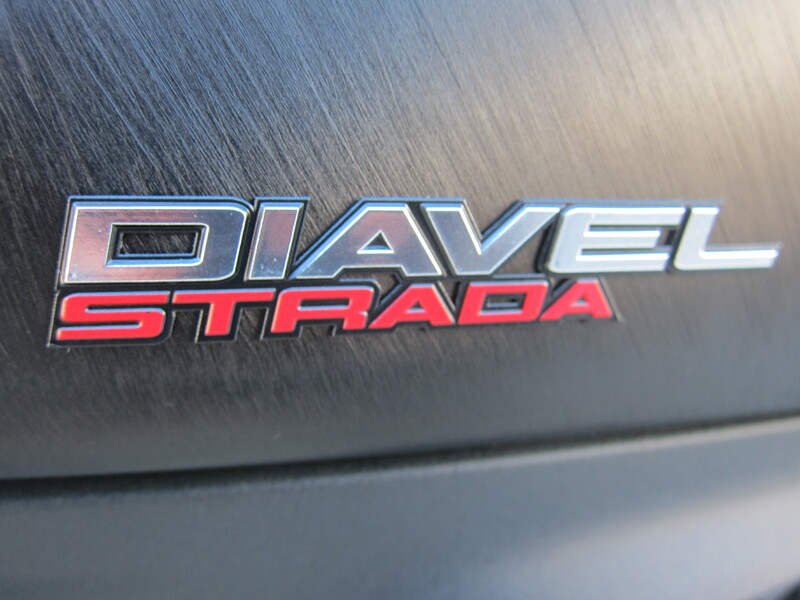 The Diavel Strada completes Ducati’s set of 2013 model launches of touring bikes, the “strada” strand. 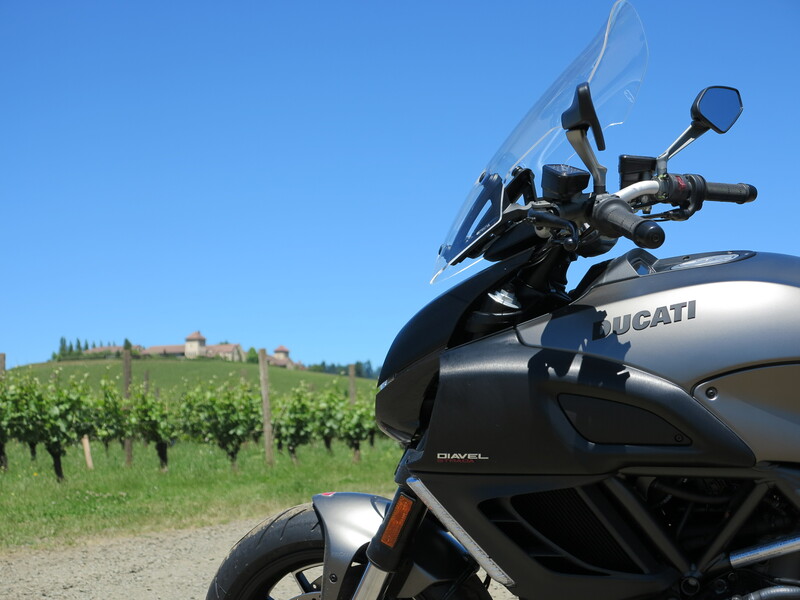 That includes the Multistrada GrandTurismo, the Hyperstrada, and now the Diavel Strada. Let’s start with the name. 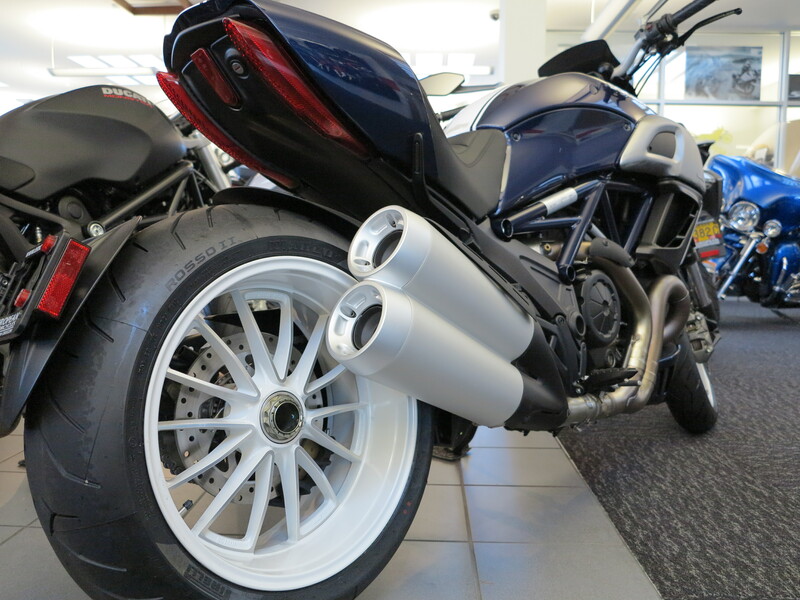 Diavel means Devil in at least one of the many Italian dialects. I quite like the name, to me it completes the design of the motorcycle, it gives a persona to the bike, one that evokes power, mischievous power. And it goes well with its little sister, the 20 year old Monster line, the only other name in Ducati’s current line up that is not a direct description of what the motorcycle is. Well, there is the Panigale, as in Borgo Panigale. Other than these three, take a look at all the other names and you know what each of those bikes are all about: Multistrada, Sportbike, Hypermotard, Streetfighter and, dare I say, Scrambler. Diavel, I like its name. Going past the name and the attitude it evokes, you swing a leg over the bike and it feels like you are… on a touring bike? The handlebars come to you for a straight up and relaxed ride position. Then your feet find the pegs more directly below you, and you are… on a touring bike? A bit more forward foot controls and you would be on a cruiser. Then you start the motor, engage first gear, release the clutch and you are… on a sport bike? This bike seems to check all of those boxes. Is there an “all the above” option? Further contributing to the possibilities this bike offers are its three riding modes. Urban with a default to 100 HP and Ducati Traction Control (DTC) at a more intrusive level (5 out of 8 levels), Touring with a 162 HP in a Low mode (less aggressive acceleration) and DTC at level 3, and Sport, with 162 HP in a High mode and DTC 1. The EMCWOR has a Diavel Strada demo, so let’s try it out, let’s see when riding this bike, what story does it really tell. I always start riding a new bike on its most tame level. I selected Urban and took off on my first ride. 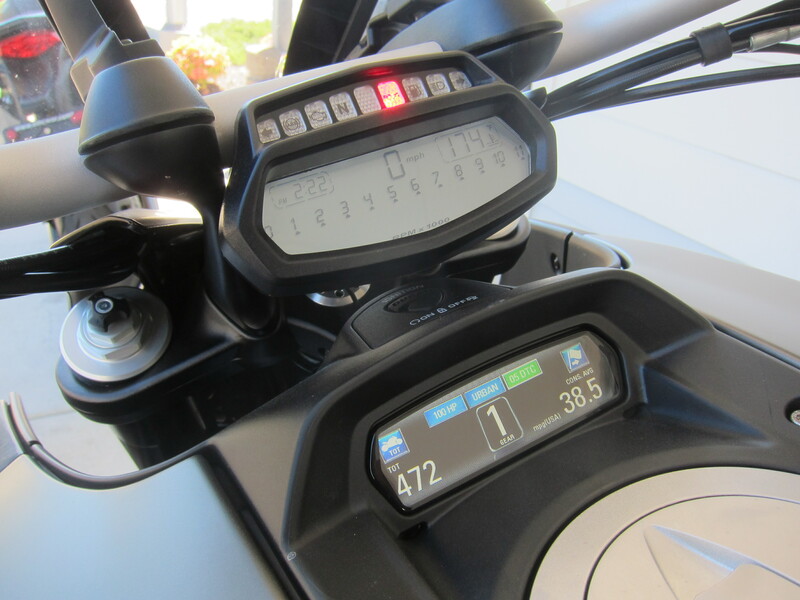 The motor is very smooth, but it is different when compared to my 2013 Multistrada. 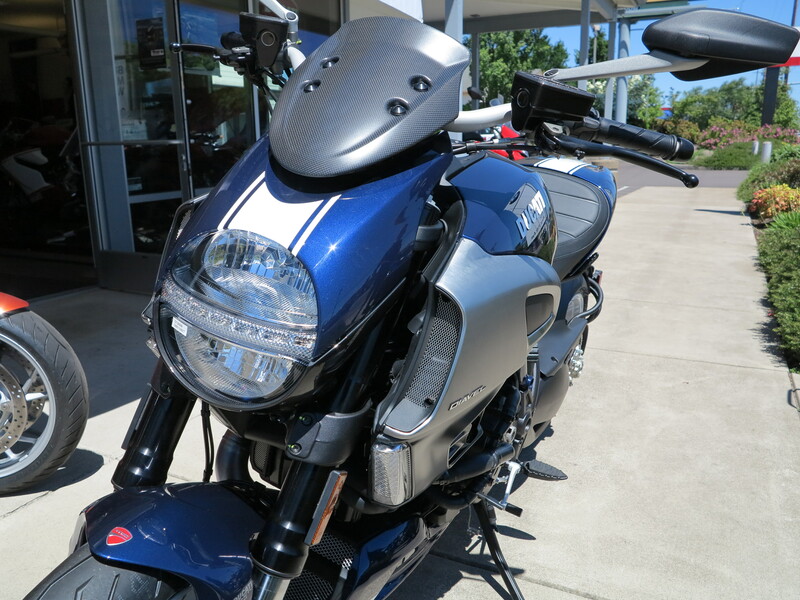 I believe this motor has a larger flywheel and that is how it accomplishes what we get in the 2013 Multistrada via the dual spark plugs and the other changes. The motor has the traditional Ducati L-twin rumble, just deeper on this bike. A really nice note. And it has this distinctive sound, when you are accelerating from a stop and going through the gears, I believe to 5-6K RPM and then you engage the clutch for the next gear, in that very short moment before you engage the next gear and release the clutch, the motor is naturally dropping its revs, and on this bike the sound it makes when lowering revs on a free of gear motor is fantastic. How can I describe it… well, take one for a ride, I can’t find a word that would make it justice. I wanted to stop and get going again just to experience that sound. Great distraction if you ever find yourself on a stop and go with this bike. It works well only on 1st, 2nd and 3rd gears, after that you will be going too fast to hear it. I went towards the roads to the south of town and soon I was in wine country. I got it on Touring mode for a little while but soon I found myself on Sport mode. The power is there! But the motor feels more relaxed, but keep in mind, we are talking 162 HP here, so when I say relaxed it is only in comparison to the balls-to-the-wall Multistrada in Sport mode, although the Multistdada is rated at a lower 150HP. It should be the flywheel, or the weight of the bike, something is keeping it a bit on the smooth and gradual side of things or without that edge you get in the Multistrada. It is a different experience, one that I believe matches well the expected nature of this bike. It does not engage you, but once you engage it, it is there! That is, this bike has enough sport riding characteristics for you to keep up with your buddies in the sport bike bikes (unless they would be racing, of course) in the curvy roads. 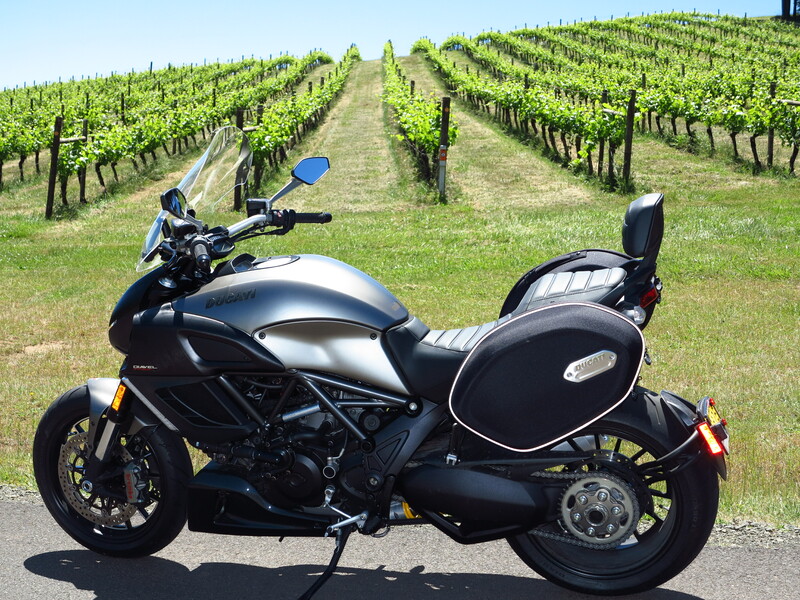 The Diavel Strada in its element. In one of its elements, actually. But they will be envying you when you take it on a relaxed and very comfortable ride to the wineries. Perfect. And of course, you could be riding this bike with your cruiser friends as well. 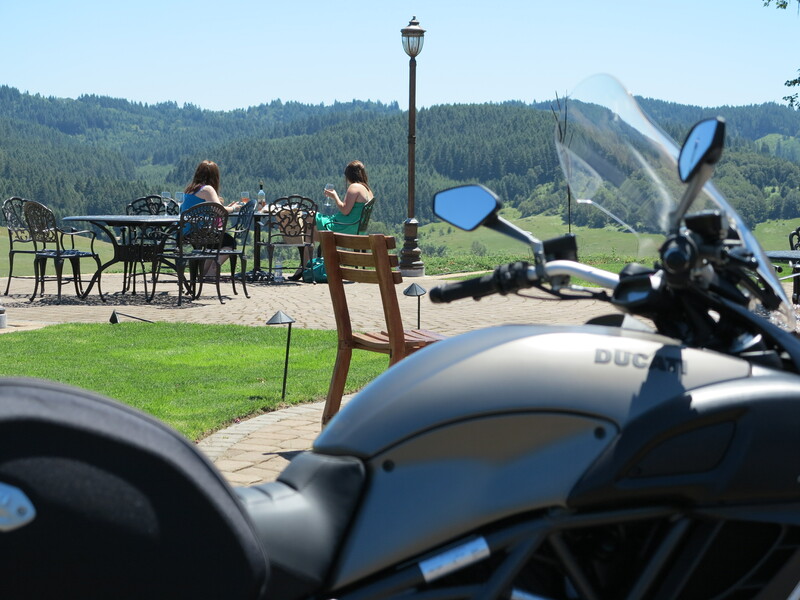 The Diavel would be the odd one out, but only you would know your bike can do what their bikes do, but better, much better than their bikes can do. Now, I’m not so sure how well a fringed jacked would match this bike. 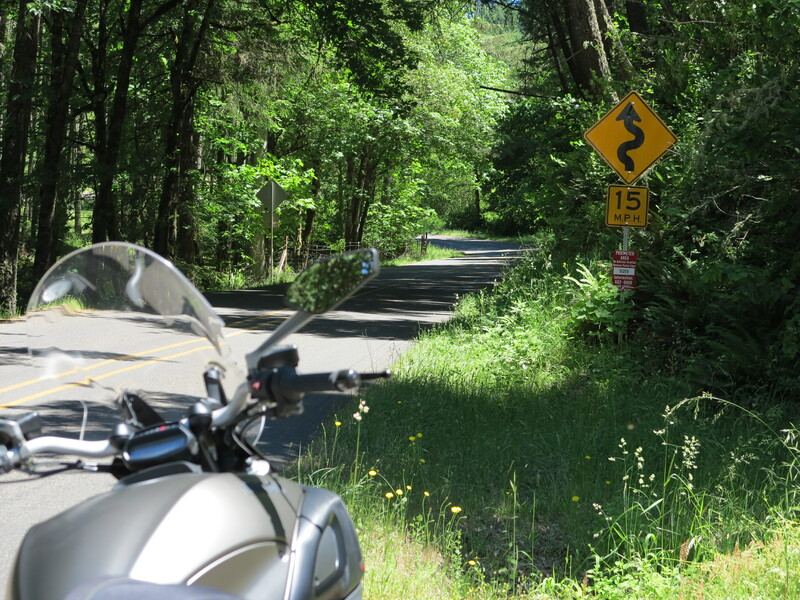 Despite (or because of) what it seems and feels like a long wheel base, I noticed this motorcycle does very well on the very slow curves and switch-backs. It leans well and it keeps its trajectory well. It inspires confidence. Eventually I took the bike back to the shop. And my question is always the same: would I buy this motorcycle? Yes. But it would have to be that blue bike. It is not a Strada version, though. I can see the Diavel in my future, when I grow up some more and realize I can do better on a motorcycle when my feet reach the ground properly. And when I would have time to spare so I could keep these beautiful white wheels white. And I would know that if I still wanted to take it to an extreme riding situation, the Diavel would not be too far out of its element. Can I have a blue one? Pretty please? I’ve thought these bikes were cool when they first came out. Too much bike for me I am sure but they are so nice. Our friend Rick did the test ride when they had the truck of them up in Portland and was impressed. I am glad you enjoyed the ride. Thanks for sharing the pictures. On a side note – did you do Rod’s Steamboat Ride this year? We didn’t make it. Hubby was beat from teaching a Team Oregon class the day before. 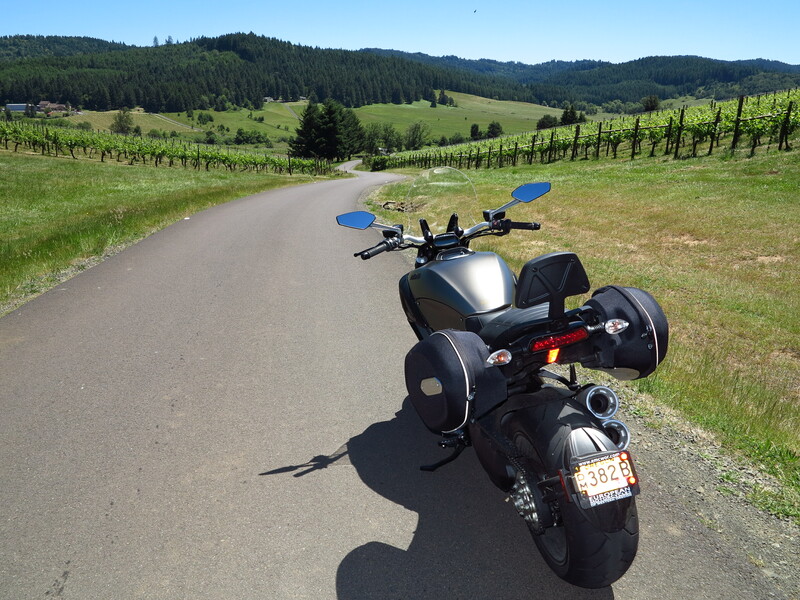 About the Diavel, it is a nice machine, and you can ride it without knowing it has all that power. It is that good. My Multistrada, well… it kind of begs you to go fast. Muito demais! Grande abraço João! Thanks Bob. To be honest with you, we don’t need all the power on our motorcycles, if we are only riding street. But it does feel good to have it on demand… Hope you are doing fine Bob. Are you coming down this way this year? Yes, you were at the end of a very long journey! Next time for sure, Bob! I have not ridden a Diavel, though I did see the new demo bike at EMCWOR today. But it always seemed to me to be a member of the power cruiser genre that started with the Yamaha V-Max in the late 1980s. Is that an unfair assessment? Give me the matte black Diavel Dark, though. Probably yes, in reference to the power cruise genre. But I’ve never ridden the Yamaha, so can’t quite tell how they compare. The dark is nice too. My favorite remains the blue/white, what a nice looking bike. So glad you mentioned the name derivation. I’ve read so many reviews sayings the name doesn’t have a meaning and I just couldn’t believe it. I bought the Devil Strada and I love it! Traded in my Duc monster. To me it’s the perfect combo between a Monster and Multistrada. And I love the video of the Diavel in the desert. Thanks! You are welcome. And congratulations, it is a very nice motorcycle.